Northlake Steel routinely produces precision turned, ground and polished (TG&P) steel shafting to tolerances as tight as .0002”. Starting as small as 0.158″ (4mm) and moving all the way up to 16” diameter, with lengths to 75’ long. Northlake offers the largest size range available, standard and metric, from a single source. Many sizes are available for immediate delivery, and special sizes can be produced to your specifications. No size is too unique, we’re eager and willing to discuss the options of producing it for you, even if it’s not a standard size or length. Our TG&P bars meet or exceed the standards set forth by ASTM A108 (ASTM A108-18, Standard Specification for Steel Bar, Carbon and Alloy, Cold-Finished, ASTM International, West Conshohocken, PA, 2018). Surface finish: 20 Ra max. Straightness: .001″ per foot max. Individually plain cardboard tubed for protection. Click here to view our Turned, Ground and Polished inventory. Contact us to learn more about our Turned, Ground and Polished products and services. Click here to read even more about TG&P and other cold finished bars. 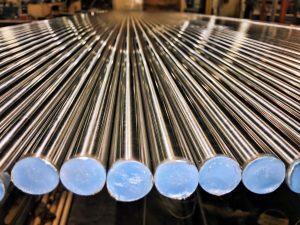 Northlake Steel Corporation started in 1977 as a 10,000 square foot facility in Mentor, Ohio with a handful of machines and operators producing turned, ground, and polished steel shafting. In 1979, we relocated to a 40,000 square foot facility in Valley View. To complement the existing services already offered, we added additional centerless turning and induction hardening capabilities. We moved into our current facility in Valley City in 1995, an 82,000 square foot facility for manufacturing cold finished steel shafting. At that time, we installed a cold drawing line to produce cold drawn bars up to 6” round. In 2013, we added 45,000 square feet to improve manufacturing efficiencies and allowed us to install additional equipment. We also added 4500 square feet of cold storage to increase our existing floor space and improve material flow. We currently have over 130,000 square feet of production and inventory space.